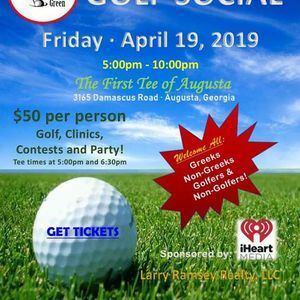 The Greater Columbia County Alumnae Chapter of Delta Sigma Theta Sorority, Inc. will host its bi-annual charity event, “Greeks on the Green” Golf Social. The Par-Tee will take place April 19, 2019 at The First Tee of Augusta beginning at 5:00pm. This event Guarantees a Fun-Filled Evening of Games, Clinics, Contest, Food and more! Everyone is Welcome: Greeks, Non-Greeks, Golfers, Non-Golfers and those who simply want to get out and have a Great Time!